Following two prestigious selections at the 40th Moscow International Film Festival and at the 23rd Busan International Film Festival, The Song of the Tree (ДАРАК ЫРЫ) by director Aibek Dayyrbekov is having its European Premiere this week at the 22nd Black Nights Film Festival in Tallin, Estonia. Film review by Bulles de Culture. Highlighting Kyrgystan’s traditions and beliefs, full of gorgeous landscapes and colorful costumes, elegantly shot and edited, this film’s immersive appeal and rhythm are irresistible. Indeed, while watching The Song of the Tree, one can’t help to think that the whole cast and crew must have deeply believed in the film they were making and in the story they were telling. The actors, in particular, give off a strong sense of earnestness which makes every singing moment resonate and matter. While the plot may appear familiar, the ingeniously steers of The Song of the Tree clear of any pitfalls it may have fallen into. Even the inevitable revenge of the hero, which starts as a mano-a-mano fistfight, luckily doesn’t play out as expected and avoids what could have been a cliché “eye-for-an-eye” resolution. Morally wrong, this would have tarnished the progressive message of the film. 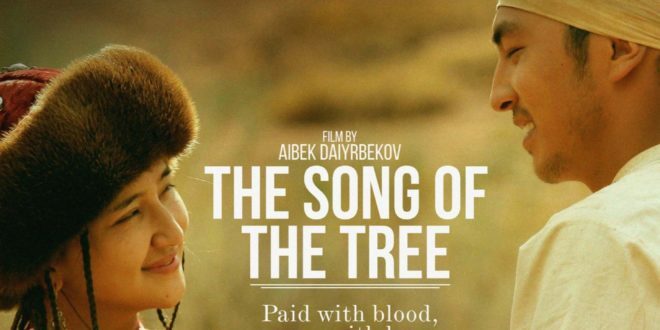 As it stands, for a universal tale about a tribe’s sacred tree and lost honor, about men’s fateful pride and women’s tearful duty, director Aibek Dayyrbekov’s debut feature film constantly surprises by presenting a much welcome, non-violent and socially-inspiring message. In this story, characters actually take responsibilities for their mistakes or misdeeds and embrace their just punishments — even and especially the tribe leaders. Perfectly concluding an already great spectacle, its grand finale reaches highly heartfelt emotions, powerful symbolic value and a really epic scope. The Song of the Tree is true cinema in its purest form. Admittedly a sporadic contributor to Bulles de Culture, but it's always close to my heart.